Nightcrawler is a 2014 American crime thriller film written and directed by Dan Gilroy in his directorial debut. The film stars Jake Gyllenhaal with Rene Russo, Riz Ahmed, and Bill Paxton. Gyllenhall plays a psychopathic, driven young man who begins shooting footage of accidents and crimes in Los Angeles to sell to news channels. The film had its world premiere at the Special Presentations section of the 2014 Toronto International Film Festival. It was released theatrically by Open Road Films on October 31, 2014. 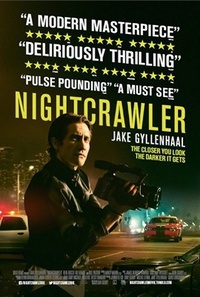 This webpage uses material from the Wikipedia article "Nightcrawler_%28film%29" and is licensed under the GNU Free Documentation License. Reality TV World is not responsible for any errors or omissions the Wikipedia article may contain.